Auschwitz, Oswiecim in Polish, was a Polish army barracks which was converted into a prison for political prisoners, then a labor/extermination camp. The prisoners were used to build Birkenbau and other camps nearby. 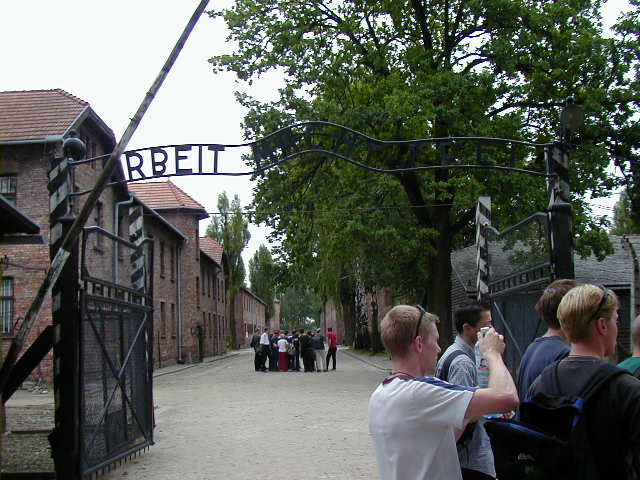 The name Auschwitz is commonly used to refer to all the complexes in the area. It's difficult to read in the picture below, but over the entrance to Auschwitz are the words "Arbeit Mact Frei"--Work Makes Free. The double barbed wire fence surrounding the camp was electrified. An estimated 70% to 75% of the people were killed within hours of arrival, and a total of 1.5 to 2 million people were executed or worked to death. 85% to 90% of the people killed were Jewish. There are only estimates because no records were kept of individuals sent to the gas chambers; they weren't even counted. Old, sick, injured or crippled people were killed immediately, along with pregnant women and most children. Young healthy people and twin children were not killed immediately. The healthy people were put to work and the twins were used for Joseph Mengele's medical experiments. 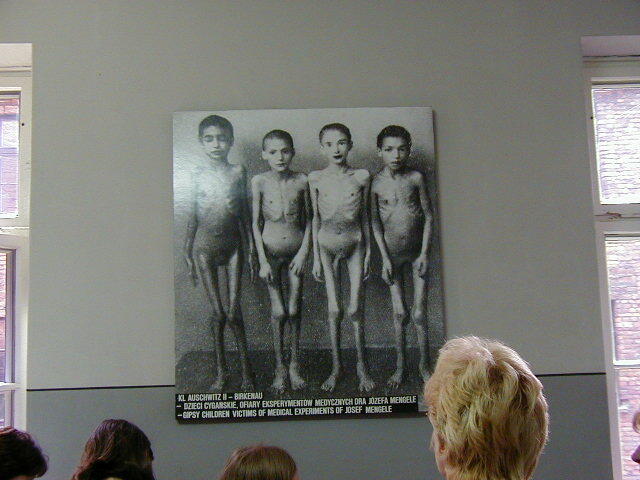 The last two pictures are of some of the surviving children, and Gypsy children used in experiments. The Nazi's were frugal killers. Everything was taken from their victims, including prosthetic devices, toothbrushes and hair. The loot that I found most disturbing were the baby shoes. The picture I took was too blurred to use here, but there was a room with a large mound of shoes taken from murdered babies. Victims weren't counted, but loot was carefully documented and shipped out. What remains was what the Germans didn't have time to dispose of before retreating. People chosen for work had everything taken from them, their picture taken and a number tattooed on their arms. They were given a prison uniform to wear. This uniform was all they had for summer and winter, day and night. They were fed a starvation diet. Some worked in nearby war factories but others worked outside in their thin uniforms year round. Winters in Poland are cold. 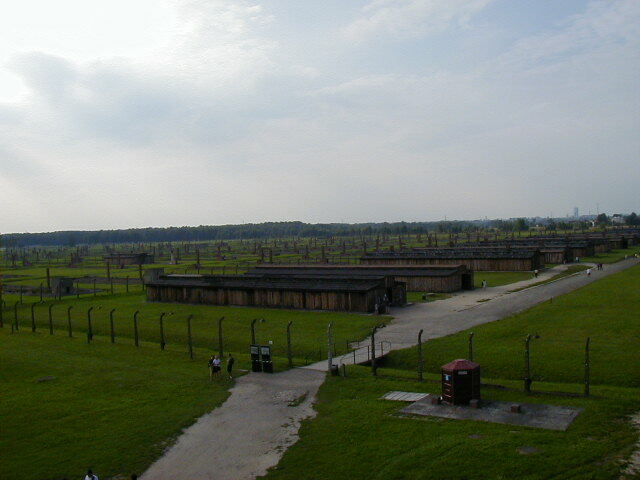 Auschwitz was in a marshy area and was plagued by mosquitoes during the summer. Epidemics were avoided by killing prisoners if they looked like they might be sick. 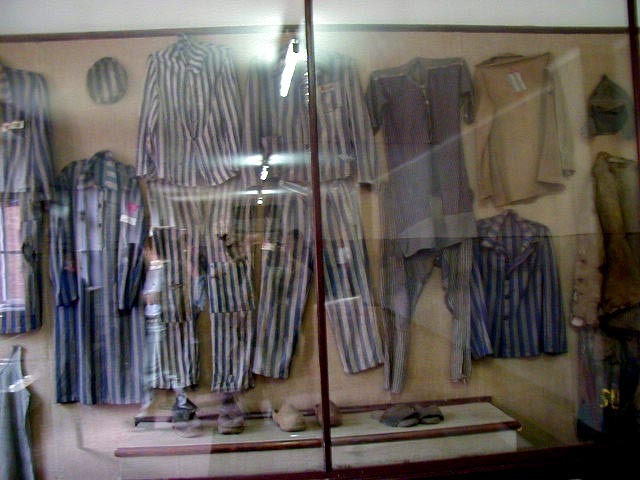 Most people sent to Auschwitz were killed within hours, most of the rest died within a few months of arrival. 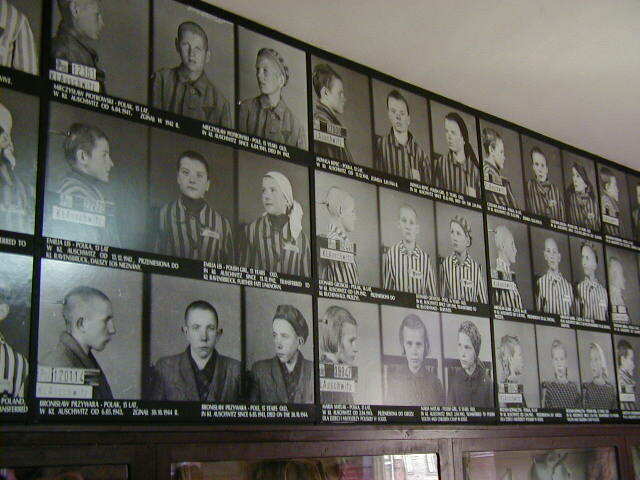 On the wall are some of the pictures of these prisoners, their arrival date, and, in most cases, when they died at Auschwitz. Political prisoners were interrogated, ordered to strip, then shot in front of this wall. They were shot naked so their clothes could be re-used. 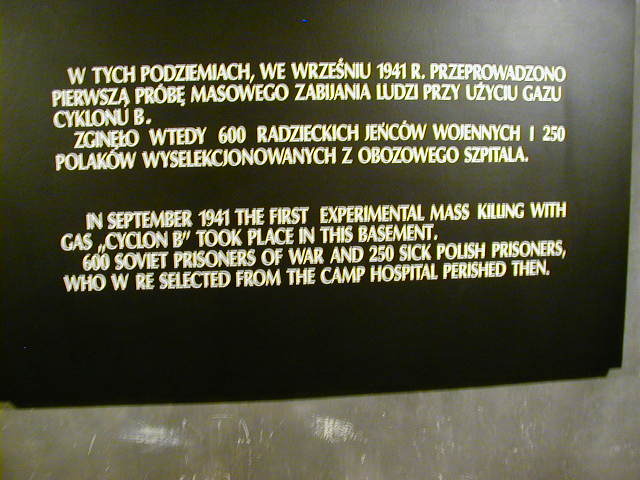 Prisoners who attempted to escape were interrogated and executed, along with suspected collaborators. 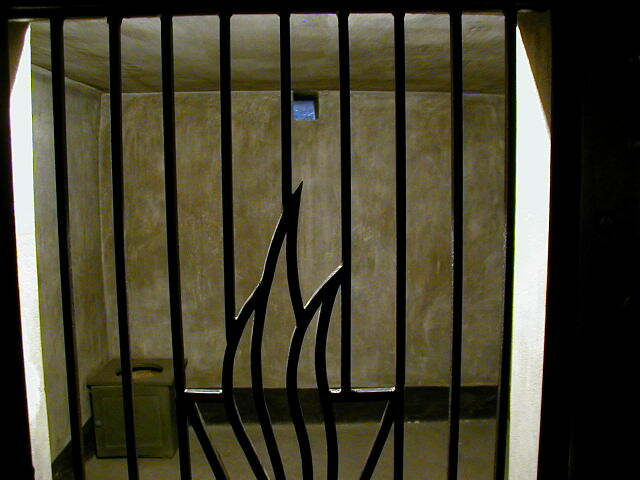 If an escape was successful then suspected collaborators were interrogated and executed. If there were no suspected collaborators available then prisoners were chosen at random and executed to dissuade others from attempting an escape. Since not escaping meant slow death, escape attempts continued, and some succeeded. Executions were often slow. A common method of execution was locking up a prisoner and letting him starve to death. In the same building where interrogations took place other prisoners were punished. 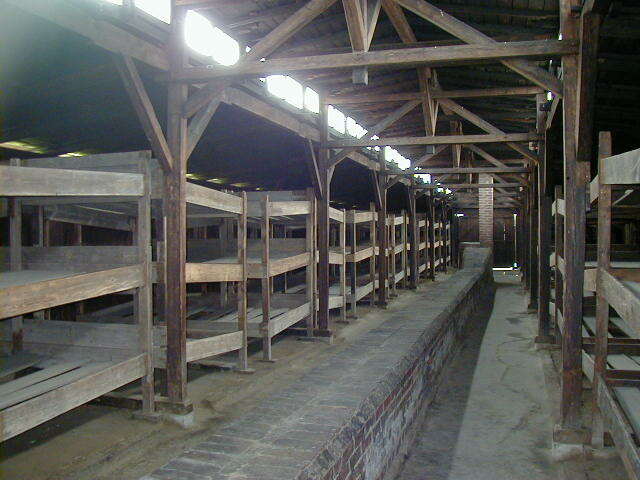 One common punishment was to pack a small cell with as many prisoners as possible. The door was locked and the prisoners were left overnight with only a small window as a source of air. About two-thirds would be dead by morning. The third picture in the sequence below shows the cell used, with the original solid door replaced by bars. 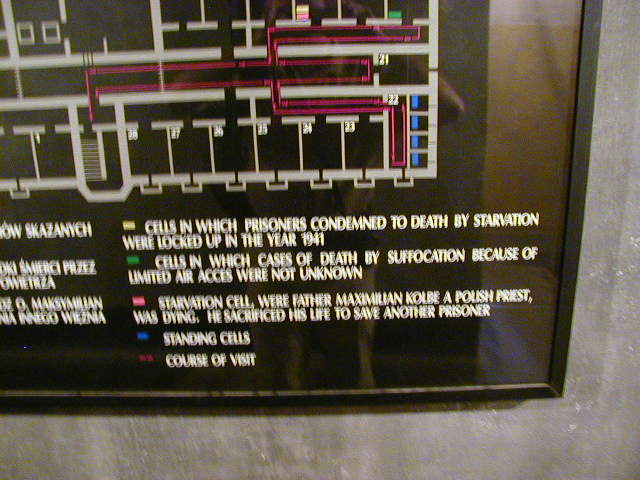 Another punishment was the standing cell, shown and described below. 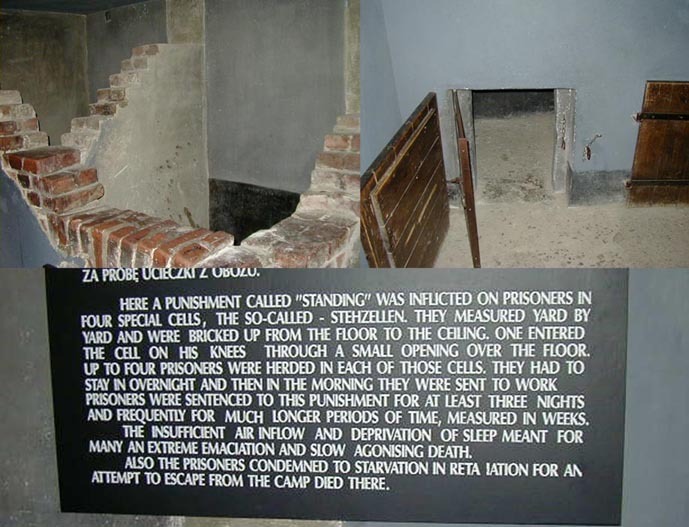 Sleep was impossible in the standing cell, and the prisoners were taken out and worked non-stop during the day. Sometimes this was kept up until the prisoners died of exhaustion. 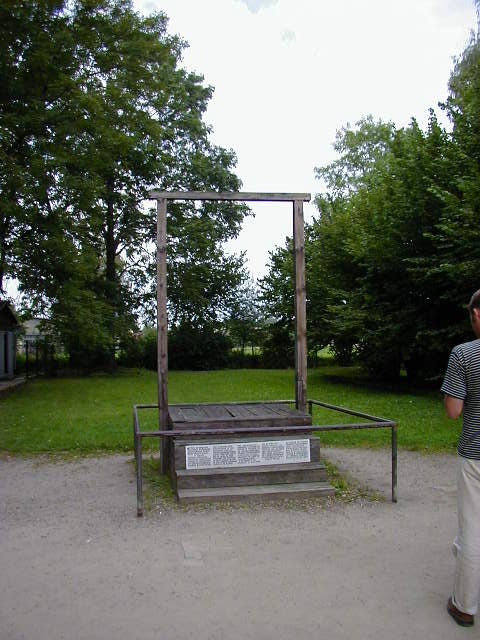 Some executions were by hanging, done in front of the camp kitchen with all prisoners required to watch. 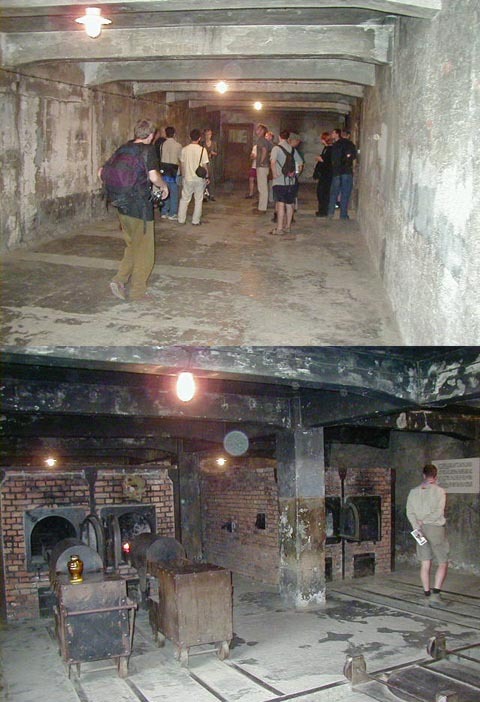 The original gas chamber and crematorium remain at Auschwitz. They were inadequate for the quantity of killing being done and were replaced by industrial size facilities built in nearby Birkenbau. 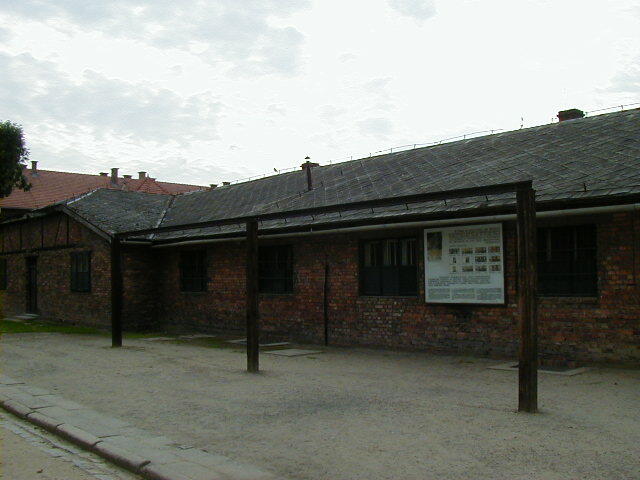 The gas chambers, crematorium and most of the buildings in Birkenbau were dynamited by the retreating Germans. These photos give an idea of the size of the place. 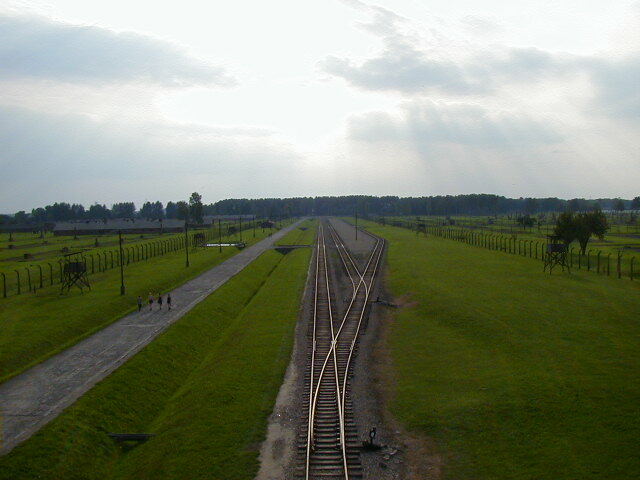 Rails were built to expedite the delivery of victims. 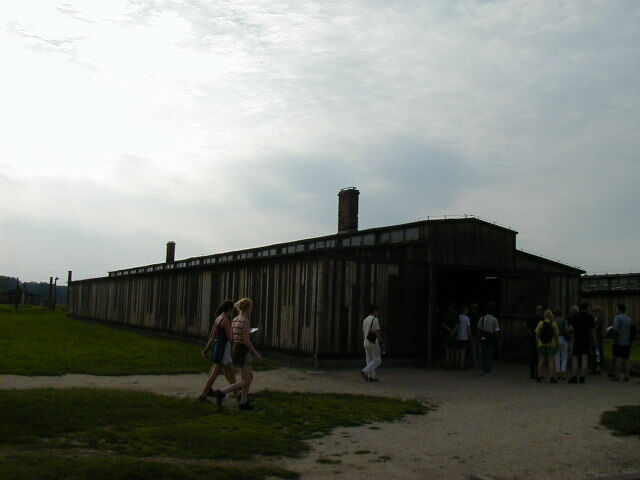 The barracks shown are reconstructions. The original camp would have had these barracks covering most of the area. They were built using a design for horse barracks. The prisoners slept five to a bunk. 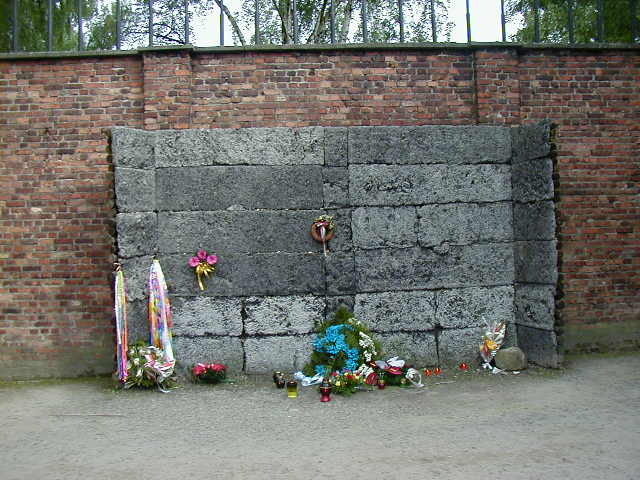 The founder and first commander of Auschwitz, Commandant Rudolf Hoss, was found after the war and hung on these gallows. Unlike the current Holocaust denial people, he did not deny the killing done under his command. His defense was that he was just following orders. The court ruled that this was not an adequate defense. It would be nice to end this page with something uplifting, but nothing comes to mind. 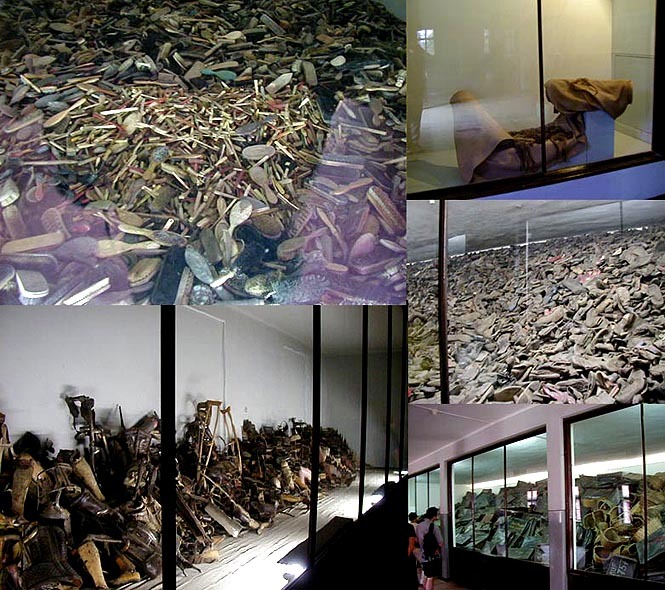 The genocide committed by Nazi Germany is unsurpassed in organization and scale. 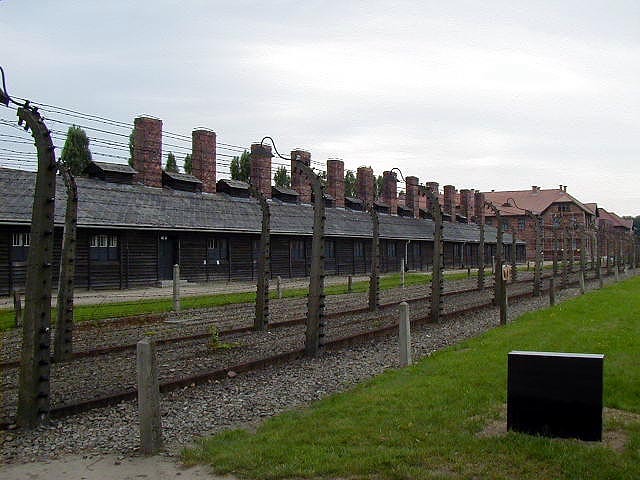 It is estimated that over six million people were killed in the holocaust, mostly Jews. It may be the largest deliberate mass murder ever committed. However greater numbers have been killed incidental to political objectives. Evidence is hard to find and estimates vague, but Joseph Stalin's five year plans* and Mao Tse-Tung's 1958 Great Leap Forward** almost certainly resulted in more deaths. Events in the '90's in Rwanda and the former Yugoslavia show that people are still willing to engage in mass murder out of ethnic hatred and in pursuit of political objectives. 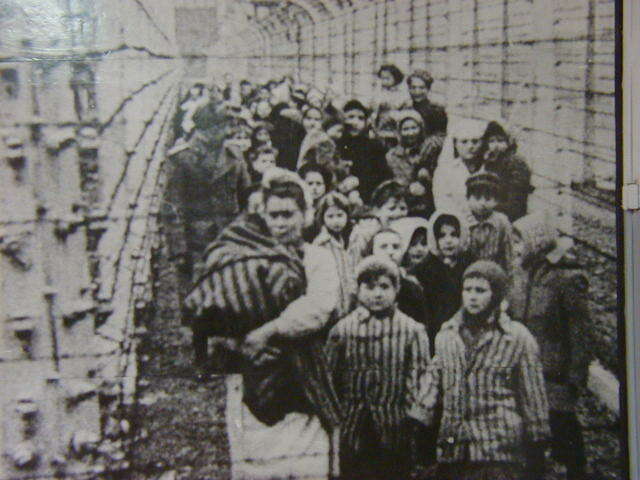 While some people may have learned from the Holocaust, collectively the human race has not learned enough. **"...estimates say that as many as 40 million Chinese may have died in a few years...", same source.